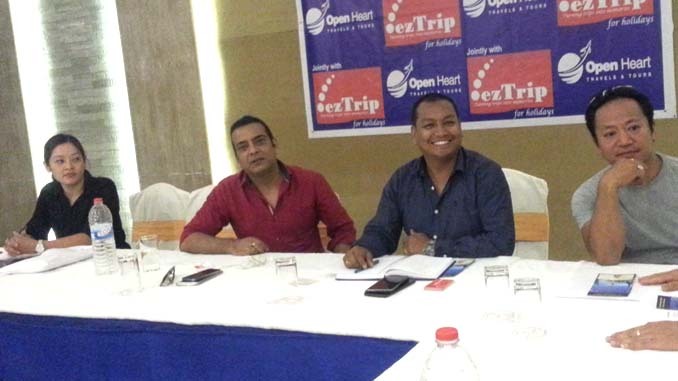 Pokhara—Open Heart Travels and Tours Pvt.Ltd and EZ Trip Pvt.Ltd have clinched a memorandum of understanding to launch a joint promotion of outbound tour activities, in Pokhara on April 19. EZ trip is a Kathmandu based outbound tour operator and Open Heart is one of the leading tour operator companies in Pokhara. Under the agreement, travelers of Pokhara now can enjoy best deals and can get first hand information related to outbound tours anywhere in the world. The MoU was signed by EZ’s founder and MD Mr. Sudesh Gautam Chhetri and Open Heart’s MD Pom Narayan Shrestha. A press meet was organized on Thursday to unveil the agreement clinched between two companies. We are for the first time coming to Pokhara market. Though presently, the outbound tour volume is not hat encouraging, but there are bright prospects as the touring culture is one of the rises from Pokhara too and being a costumer oriented company with a track record of 99.9 percent satisfied customers, the press release states. According to release, Nepali outbound travelers spent a total of Rs 56.42 billion in fiscal 2015-16, which stood at Rs 53.19 billion in fiscal 2014-15. The NRB data reveals that expenses of Nepali outbound travelers have been increasing every passing year. Macroeconomic Outlook states that the amount that the country spends on travel in substantially higher than the amount the country receives from tourists visiting Nepal. The country in the review period earned Rs 36.2 billion from tourists under travel heading against expenses of Rs 50.64 billion. EZ Trip Senior Executive Deepshika Shrestha presented slides on company’s motto and the services the company providing in the press meet. EZ Trip MD Sudesh Gautam Chhetri thanked all the journalists who join the press meet. Open Heart MD Pom Narayan Shrestha expressed his happiness that the result of that MoU will be fruitful for both the companies.